Elyse Zorn Karlin is a jewelry historian and journalist. She is the publisher/executive editor of Adornment, The Magazine of Jewelry & Related Arts and co-director of The Association for the Study of Jewelry & Related Arts, open to anyone who has an interest in studying jewelry. Karlin is a noted speaker and an expert on jewelry of the Arts & Crafts and Art Nouveau movements. She runs an annual conference on jewelry open to all jewelry lovers and is working on a book about jewelry of the American First Ladies. Julie is the owner of Chapel Hill Vintage Jewels and has been a collector and antique dealer for many years. Born in Western New York, she accompanied her parents on week-end outings to estate sales and antique shows and began her collection and love of vintage costume jewelry. Her professional career as a marketing and sales executive for high tech companies allowed her to travel extensively, both in the United States and in Europe. Everywhere she went she would visit outdoor markets and antique shops, museums and exhibits collecting and studying vintage jewelry and antique linens. Since retiring, Julie is able to accompany her husband Steven, a UNC Professor, on his business trips to pursue her passion and the worldwide hunt. Her special interest and the focus of her recent research is the study of Elsa. Julie is an active member of the Costume Jewelry Collectors International and the American Society of Jewelry Historians. She holds a Masters Degree from Northwestern University and a Certificate in Non Profit Management from Duke University. She has studied jewelry through courses with the late Christie Romero, Christie’s Education in NYC, NYU Short Courses and CJCI! Julie is a frequent speaker at local events on Vintage Jewelry and on options for downsizing all kinds of collections. The purchase of a large collection of Schiaparelli 1950s jewelry began my search for information on everything related to Elsa Schiaparelli, her life, her couture creations and her jewelry. Trips to the Library of Congress, Philadelphia Museum of Art, Paris Museum of Decorative Arts and lengthy conversations with BillyBoy*, author of Frocking Life: Searching for Elsa Schiaparelli have provided some important insights. This session will provide new information clarifying the attributes of her couture inspired jewelry and those created as a result of her licensing agreements. Deirdre launched her line of vintage-inspired costume jewelry in 2013 with the goal of creating a line that reflects the quality and craftsmanship of the vintage pieces she collects. Her whimsical designs successfully debuted at Bloomingdale’s and Henri Bendel in New York and are now sold at boutiques around the country, including, her shop located in downtown Charleston, SC and her online shop candyshopvintage.com . Her collection of designs, known as the Candy Shop Collection, are designed and made in the U.S.A. – primarily in the Rhode Island Area. Through her jewelry adventures, Deirdre met and became friends with Kris Ciulla, the vice president of Ciner Manufacturing, and current owner, Pat Ciner, who is the founder’s granddaughter. Working together, they launched their first capsule collection, The Fantasy Garden in the Spring of 2017 to celebrate CINER’s 125th year in business. Long-time CJCI members know Erik Yang as an astute costume jewelry dealer with an amazing customer base. He is also fervent collector with exceptional taste and discernment when it comes to buying and selling the best of the best. His extensive knowledge of both vintage and contemporary designer jewelry make his presentations both entertaining and informative. He previously made a presentation on the topic of Mexican silver, one of his many specialties as a dealer and collector, at a past CJCI convention. In 2017, Erik will present “The 1980s: The Trends, the Influences, and the Designers” to correlate with the theme for our Lifestyles of the Rich and Fabulous weekend. New Jersey native Sharon Schwartz graduated from Drexel University with degrees in home economics and early childhood education. In 1988 she formed, Of Times Gone By, an antiques business specializing in handbags, vanity items, and linens. An active vendor at major antique shows in the Philadelphia area, she has been an online retailer for over a decade. Sharon is the co-author of Eisenberg Originals: The Golden Years of Fashion, Jewelry, and Fragrance, 1920s-1950s. Her Eisenberg collection includes many unusual and rare pieces. As a long-time CJCI supporter, lecturer, and instructor, Kevin is back by popular demand! Kevin will be teaching a specific beading technique to give participants hands-on experience in learning some of the bead-design work of his native South Africa. Each student will be giving a project to complete during class. Renowned South African jewellery designer Kevin Friedman has captivated both the local and international jewelry trade with his one-of-a-kind pieces which use an innovative combination of high cartage gemstones and precious metals with ordinary everyday “found objects”. Barbara Schwartz is a vintage costume jewelry retailer, researcher, writer and speaker. She combines her life-long passion for jewelry with her research and analytical skills and interest in social history. Her website (www.trufauxjewels.com), blog (www.trufauxjewels.com/blog), published articles, and lectures focus on jewelry as accessories to fashion and on fashion as a reflection of/reaction to world events and social conditions. With an eye for high-quality and unusual pieces made in North America and Europe from the 1920s – 1950s, Barbara is an expert in helping women select wearable pieces that are just right for their personal style. She creates ensembles that she publishes on her Polyvore site and often features in blog posts. She recently wrote “How to Wear Vintage Costume Jewelry” for style expert Deborah Boland’s website: http://www.fabulousafter40.com/how-to-wear-vintage-costume-jewelry. The article gives tips on choosing contemporary earrings to wear with a vintage necklace and today’s clothing and accessories. Barbara is a member of the Costume Jewelry Collectors International, Association for the Study of Jewelry & Related Arts, American Society of Jewelry Historians, Vintage Fashion Guild and Costume Society of America. She is a former librarian, records manager, and information management consultant with Bachelor of Arts and Master of Science degrees. Mary Ann Docktor-Smith is a vintage jewelry collector, historian, dealer and member of Costume Jewelry Collectors Int’l. She also creates artisan jewelry using vintage and natural stone beads, polymer clay and cork. Mary Ann is an expert on Selro jewelry, and Florenza jewelry and the history of Dan Kasoff Inc. She has presented on vintage jewelry topics in several venues, including CJCI Annual Convention, Bead Society of Greater Chicago, Chicago Botanic Garden, and 2007 VFCJ Vintage Jewelry Cruise. Mary Ann’s two-part article Costume Jewelry Manufacturing Concepts appeared in the Fall and Winter 2010 issues of Costume Jewelry Collectors International magazine. She has also written several articles for The Jewelry Ring, including a monthly column, Jewel Notes from Mary Ann. Before becoming a full-time jewelry dealer, Mary Ann spent many years in the financial services industry, first as a business-owner, and later as a relationship manager with a large international bank. Susan Klein Bagdade is the author of “Mid Century Plastic Jewelry” from Schiffer Books. Formerly, Susan wrote the “Bling & Things” Column for “Antiques & Collecting Magazine” and is an active member of the Chicago chapter of (CJCI) Costume Jewelry Collector’s International. She got her start in the antiques business working for Leslie Hindman Auctioneers and spent five years as the Senior Manager of Client Accounts for Sotheby’s Chicago. For three seasons, she worked as a production assistant on the popular HGTV television program “The Appraisal Fair”. Susan’s day job is as the Director of Richard Norton Gallery in Chicago, a gallery specializing in Modern and Impressionist art, but costume jewelry is her passion! Katerina Musetti is a couture jewelry designer and owner of KM Designs. From as early as Katerina can remember art has been a part of her soul. She has been painting, silk-screening, bead embroidering, working on a potter’s wheel and designing and selling couture gowns since the age of thirteen. Her father had a woodworking studio where he would produce the most awesome designs with incredibly gorgeous rare woods, while my Mother painted, upholstered and sewed. Art was a constant in our home….so was Mario Lanza, Beverly Sills and Opera. The Visual and Performing arts have always been closely integrated for her and she knew that at some point in her future the two would merge. During her performance career in Europe, which spanned over nine years, she would carry her canvas and oil paints to rehearsals. She painted in the evenings and on the weekends while in production. One summer while walking in a piazza in Milano, she approached a woman wearing a colorful necklace and asked her what the material was. It was during this time that she discovered the wonderful medium polymer clay. She began experimenting with FIMO and CERNIT which eventually led to her line of OPERA PURSES, VESSELS and JEWELRY. Most of the pieces incorporate image transfers from her original oil-paintings with techniques she developed over time. Many of the pieces are inlaid with precious and semi-precious stones including citrine, tourmaline, peridot, amethyst, zircon and diamonds. Today, Katerina works as a couture jewelry designer and applies her passion toward designing and creating contemporary rhinestone jewelry. The jewelry is reminiscent of the bygone days that were filled with everything glamorous and over the top. For the jet-set, she also designs an exclusive avant-garde line. Her one-of-a-kind rhinestone creations are all hand soldered with meticulous attention to design and detail. Swarovski crystal rhinestones are the canvas in which she paints, while incorporating vintage cabochons and art glass from Czechoslovakia, Japan, Germany, Italy and other places around the world. Her pieces are big, bold and elaborate with the necklaces designed to also be worn as angled collars. Most of her brooches are over five inches long with sultry dangle earrings designed to fall to a beautiful mid-neck length. Bracelets can be created in most styles including large cuffs and multiple link designs. Her entire line is plated in 14K gold and bears the “Katerina Musetti Designs” hallmark. Katerina Musetti, is also the author of The Art of Juliana Jewelry (Schiffer Books). For more information please visit www.katerinamusettidesigns.com. Karin Zwaneveld was born in The Hague, the Netherlands, and now resides in Apeldoorn, the Netherlands. During her career, she has specialized as a dealer in Art Nouveau and Art Deco interiors and jewelry for 16 years and has lectured on Art Nouveau artists at the local museum of her hometown. With old world charm, the front side of her house, located in the center of Apeldoorn, is her shop. As an active dealer, for over a decade, she has participated in the annual Art Deco fair in The Hague. Having focused on Art Deco jewelry, Karin became intrigued by collecting and selling vintage costume jewelry. As a dealer today, she has one of the largest collections of vintage costume and haute couture jewelry in Holland. Her selection includes Christian Dior from the 1950s-1970s, Yves Saint Laurent, and Lanvin, as well as an extensive collection of Jean-Louis Scherrer. These Scherrer pieces have only been worn by the models on the runways of the Haute Couture shows in Paris in the late 1980s. Now she eats, sleeps and breathes vintage costume jewelry and tries to spread her enthusiasm in the Netherlands while participating in numerous antique markets and fairs. This task is not an easy job, because unlike in the United States and United Kingdom, Dutch women are not familiar with this kind of jewelry and are a bit more reluctant to express themselves in opulent clothes or exuberant accessories. Karin enjoyed meeting like-minded jewelry enthusiasts and sharing her research on Jean-Louis Scherrer with fellow attendees at CJCI Convention 2014! Michael has been selling the last remaining pieces of finished jewelry from the incredible Scannavino archive. 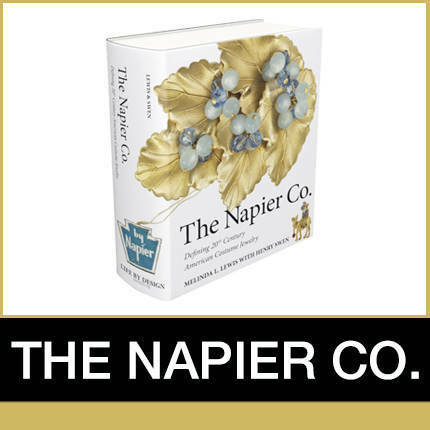 Mike Ruggiero began his career at The Napier Co. in 1978. He started as a skilled model maker in the design department. In the 1980s, his skill and understanding of white metal casting helped Napier with the expansion of manufacturing by using this technique in-house. This expansion led to the establishment of the company’s first model-making facility in Providence, Rhode Island. Mike’s skills went beyond model making and he soon became known for his talent in jewelry design. In 1985, he became vice president of design for Napier and remained with the company through its subsequent acquisitions. Mike’s designs from 1980s, especially the Napier crystal stone pieces, are greatly sought after. Mike currently serves as the senior designer for IBB/Jule B. Formerly he served as director of jewelry design for Crimzon Rose Int’l., FGX Int’l, design consultant at Easthill Mfg, and design manager at Artist Empire Jewellery. During Mike’s career, he has worked on several private label brands for department stores such as Macy’s, Bon Ton, and small chains. Currently Mike lives in Rhode Island with his wife, and in his spare time enjoys seeing his grandchildren. The IBB group (International Bullion Brokers) is a privately owned, an international group of companies located in Florida, the U.K., and Thailand. The U.S. division is a designer and distributor private label sterling silver jewelry to retailers throughout the U.S including Macy’s, Kohl’s. J.C.Penny, Belk and Bon Ton department stores and many specialty stores. The sterling division sells under the name IBB. The Jules B. division is the costume side of the business and is relatively new. In less than two years, Jules B. has gained distribution in several major retailers and is continuing to gain recognition for its unique approach to costume jewelry and successful acceptance by the consumer.